Photos of Google’s first 10-inch tablet surfaced online on Friday. 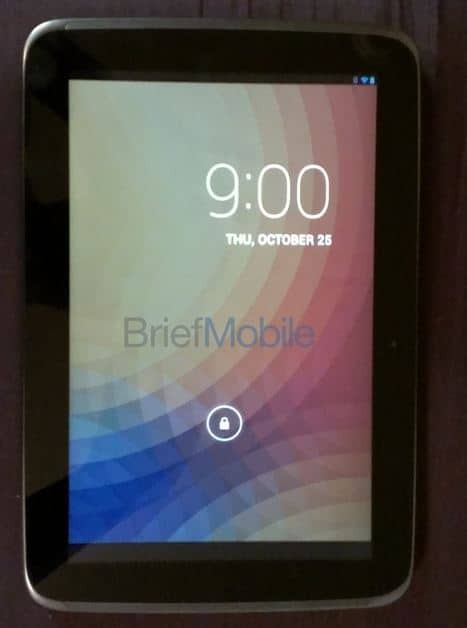 The photos were published by BriefMobile, where it was reported that Google’s upcoming Nexus 10 will be made by Samsung and will come with Android 4.2 Jelly Bean installed. The Nexus 10-inch Super AMOLED display has a 2560 x 1600 pixel resolution at 298.9 pixels per inch. The tablet is powered by a dual-core Samsung Exynos 5250 CPU clocked at 1.7 GHz, Mali-T604 GPU, 2GB of RAM, and 16GB internal storage. Samsung also equipped the Nexus 10 with a 5-megapixel rear-facing camera, and a front facing camera as well. For quick payments, Samsung embedded a NFC chip to the Nexus 10. The 10-inch tablet has Bluetooth 4.0, WiFi connectivity, and two speakers on front. It appears that Google will push owners of this device to rely on Google’s Drive for more storage, making more money out them. As stated on the site, the Nexus 10 doesn’t have any microSD card slot and it is likely that the tablet will come with Google Drive preinstalled. This device is expected to be announced on Monday, October 29th, in New York City.